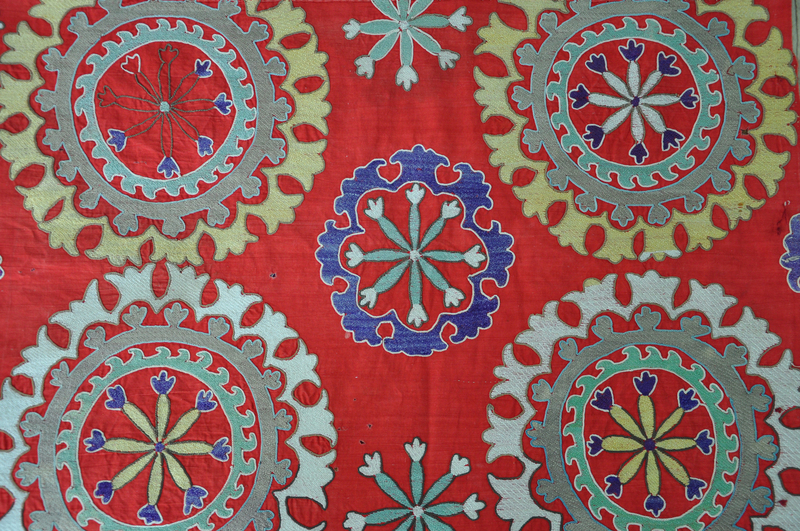 The word, Suzani, from the Persian word for needle, “Suzan”, is a centuries-old handicraft from several Central Asian countries including Uzbekistan and Kazakhstan. 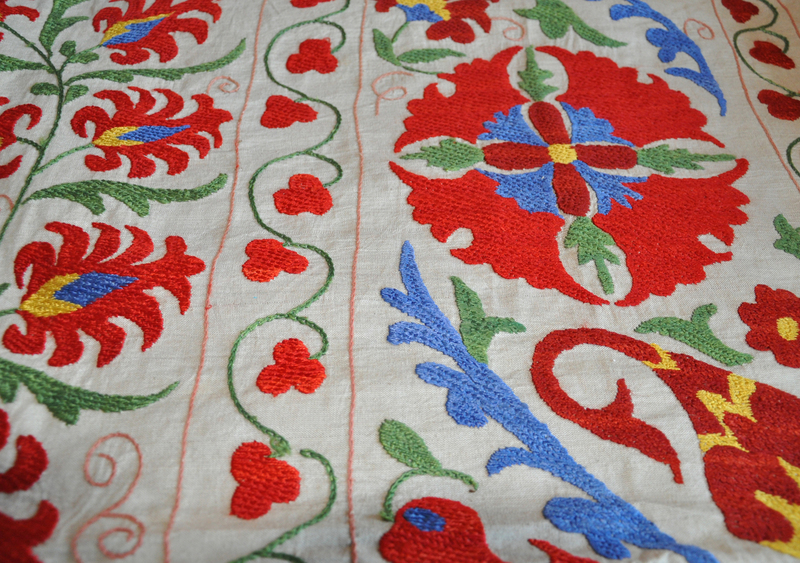 These ancient embroidery techniques and motifs were passed from grandmother to mother to daughter and were typically made as dowry quilts. Whether settled or nomadic, the lives of women in Central Asia in ancient times were hard and their surroundings often bleak and unforgiving. But if one stepped inside of a yurt, for example, it would be embellished wall-to-wall with magnificent Suzani embroideries, large and small, as bed covers, wall hangings, room dividers, tent flaps, and a great deal more. But more than being simply decorative, embroidering Suzanis was more significantly a means for women to express themselves, display their skills and diligence as a potential bride, brighten their hard existence, indicate their status, and to earn extra income for their families through trading and selling these beautiful textiles, often to wealthier clients in the city. 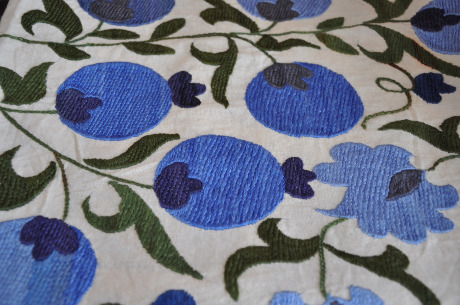 The quilts are sewn using silk or cotton embroidery on woven silk and cotton backgrounds to make vibrantly colored botanical motifs such as meandering vines, pomegranates, tulips, wild hyacinths, and the palmetto leaf. 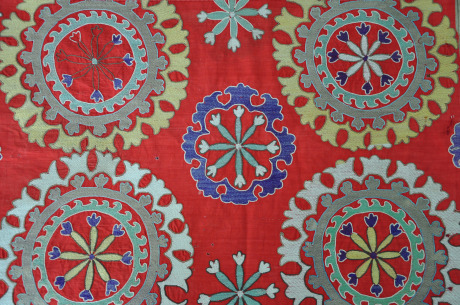 These ancient motifs come from origins as diverse as the Ottoman Empire, Ancient Greece, and Mughal India – evidence of the co-mingling of cultures through centuries of trade along the Silk Roads. Traditionally, large Suzanis are made up of strips of fabric which are sewn together loosely so that a pattern can be drawn on, then taken apart so they can be divided among friends or family members to be worked on at the same time. The panels are later re-sewn together, and stitches are added in where parts of the pattern may no longer match up. This only adds to the one-of-a-kind nature of each quilt. Flaws, such as voids of missing stitching, a tattered edge, or the occasional pen markings of the quilter’s hand-drawn patterns are not considered among collectors and admirers to detract from the beauty of the quilt.